Volkswagen subsidiary Electrify America was created as part of the automaker's settlement with federal regulators for intentionally misrepresenting its diesel emissions. Volkswagen Group unit Electrify America will invest $300 million to expand its electric vehicle charging stations and technology. The company on Thursday said its National Zero Emissions Vehicle investment plan for Cycle 2 will invest charging stations in 18 metropolitan areas, including five new regions: Atlanta, Baltimore, Honolulu, Las Vegas and Phoenix. The plan will begin in July. "At Electrify America, we understand that we have a significant role to play in bringing the United States into the age of electric cars," said Giovanni Palazzo, CEO of Electrify America. "This Cycle 2 plan allows us to further accelerate progress on our goal of making electric vehicle charging more available, more accessible and easier for drivers to use." Additionally, Cycle 2 will include investments in autonomous charging and renewable generation for charging stations, the company said. An Electrify America spokesman told Automotive News on Thursday the company will build up to two commercial deployments of charging stations for autonomous EVs. He said the locations still have to be selected. Select stations will also promote renewable generation to help reduce station operating costs and reduce higher carbon content that linked to EV refueling, the company said. Electrify America said it will engage in a brand-neutral campaign to drive ZEV adoption and a branded media campaign intended to urge station use. As part of its Cycle 1 investment, Electrify America announced Monday that it will install Tesla Inc. battery storage packs at more than 100 charging stations across the United States to keep costs down for drivers charging electric vehicles. The Volkswagen unit said most of the battery packs will be installed in areas of the United States that has a higher concentration of electric vehicle owners, particularly on the West Coast and the Northeast. Electrify America was created as part of Volkswagen's settlement with federal regulators after it admitted installing software in diesel-powered vehicles to cheat on emissions tests. 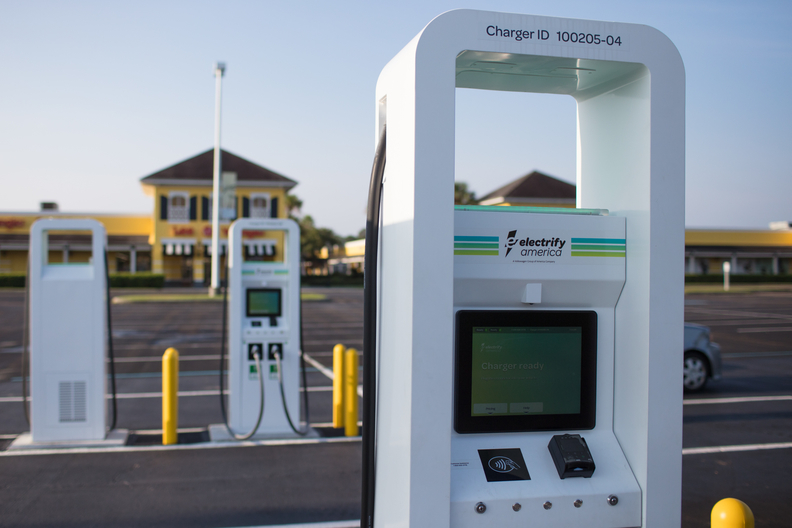 The automaker has committed to investing $2 billion over the next decade into developing a nationwide web of fast chargers accessible to all brands as a result.